With this year’s theme, “One City for the World,” the 2016 QCinema International Film Festival (QCinema) continues its thrust as a world-class event through an interesting mix of new homegrown films and award-winning international movies. 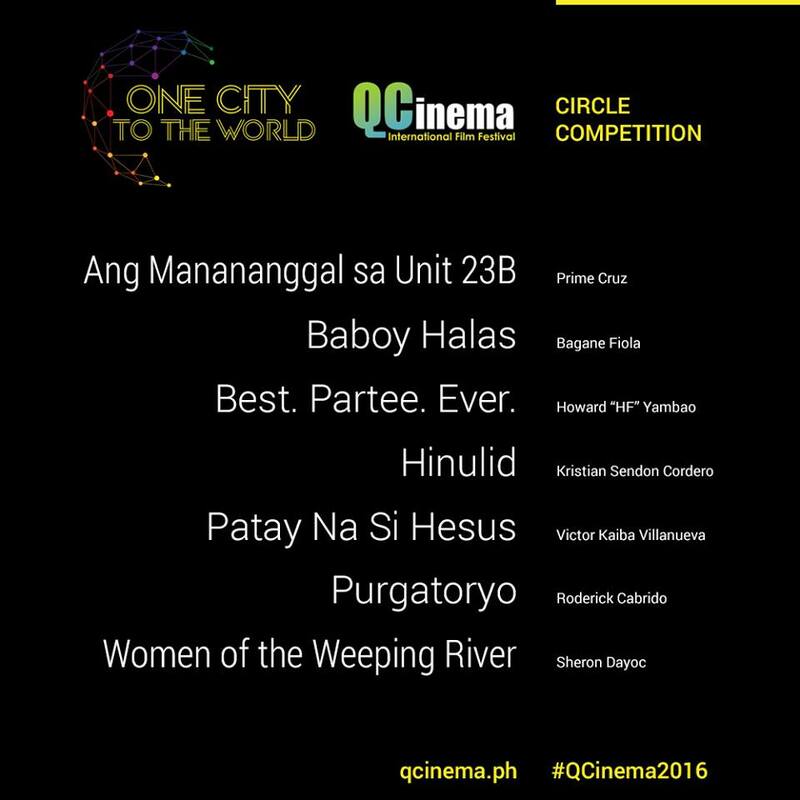 QCinema will run from October 13 to 22, 2016. It will be held at four mall venues namely: Ayala Trinoma, Gateway Cinemas, Robinson’s Galleria, and UP Town Center. 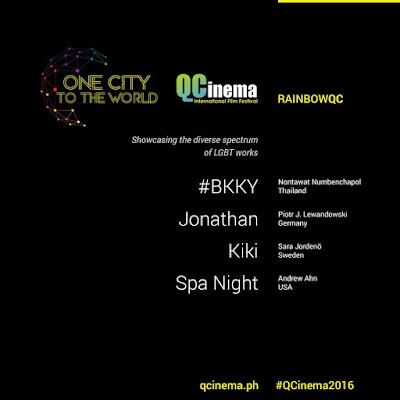 It will also hold special film forum series at the QCX, the new museum complex of the Quezon Memorial Circle. Since its foundation in 2012, the Quezon City Film Development Commission (QCFDC) has been providing grants to help filmmakers produce their own works. QCinema is its annual platform where the new cinematic gems are given the chance to be appreciated by the public. 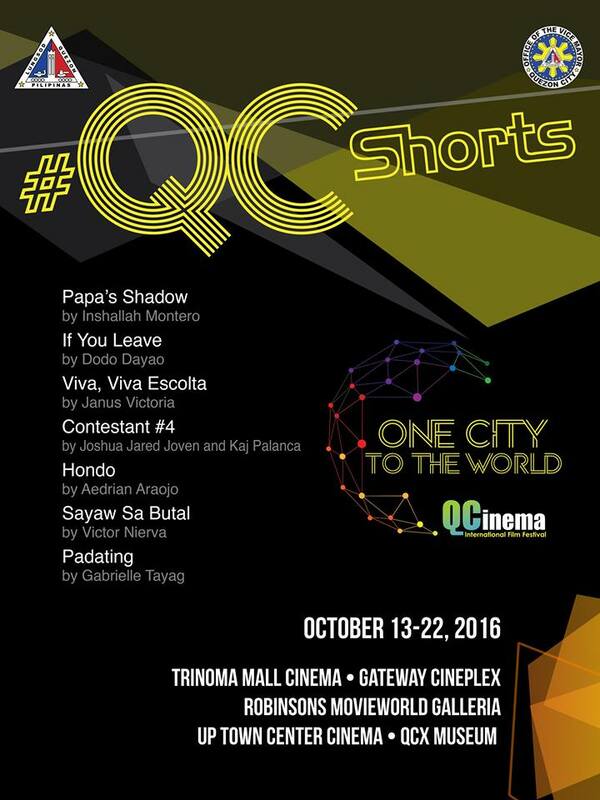 This October marks the premieres of QCinema’s new seven (7) features and eight (8) short films which the QCFDC funded. The Circle Competition grants are unique in that filmmakers own the rights to their features while #QCShorts is the only local funding platform for short films. 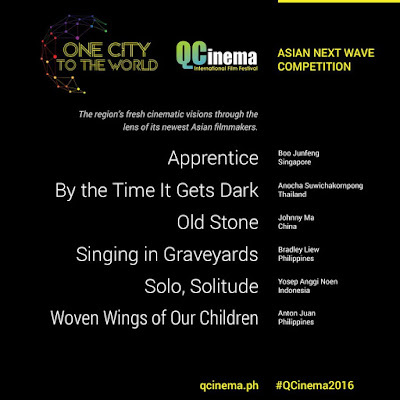 Seven original and well-made short films will premiere at #qcinema2016. Production grants of P 100,000.00 were given to each film. Contestant #4, the film of Jared Joven and Kaj Palanca, follows a young boy who frequently visits an old man who lives alone, keeping him always in good company. One night, he chances upon the old man watching a dated clip of himself as a cross-dressing boy. This sparks the interest of the young boy to find out more about the old man's past. As the movie progresses, the two main characters gain a richer understanding of how the weight of life and identity should be carried. If You Leave by Eduardo Dayao shows two amateur ghost hunters who are hired to inspect an alleged haunted house. Nothing much happens for the two but Dayao points out that not seeing patterns of strangeness does not mean that the spirits are not there. In Sayaw sa Butal (Coin Dance), Victor Nierva immerses in the world of Alona, a middle-aged woman, who attempts to possess her heart's desire: a man who frequents her fantasies and the toilet of the Naga City bus terminal. Janus Victoria’s new piece, Viva, Viva, Escolta, focuses on the story of two ghosts. Consuelo, a ghost who has haunted Escolta for many years, finds a respite from her loneliness in Joey, a young man who has just died. As the two ghosts pass the time before Joey moves to the afterlife, Consuelo questions her reasons for staying put. Padating by Gabrielle Patrice Tayag is an airport drama that revolves around Kaye and her estranged father. Kaye arrives at the airport in Pampanga where she waits for her father to fetch her. Upon arriving, her father tells her they have to wait for another arrival later that day. In those first few hours they spend together, how do they both attempt to get to know each other? Zamboanga-based director Aedrian Araojo’s Hondo (Deep) shows the unstable relationship between Mara and her son, Elim. Mara is scared of water. She has a rare condition that keeps her from touching anything that is liquid. As a single mother, her only pearl is her frisky son, who is later on diagnosed with a deadly disease. Inshallah Montero uses the elements of shadow plays in her film, Papa’s Shadow. Little Mia has a lot of questions about death even if she is only seven years old. She has always heard about it but never fully understood it. Feeling the loss of her own father, Mia struggles to see her mother’s sadness grow heavier each day. To cope and understand the meaning of life and death, Mia turns to the shadow puppets her father had left her. 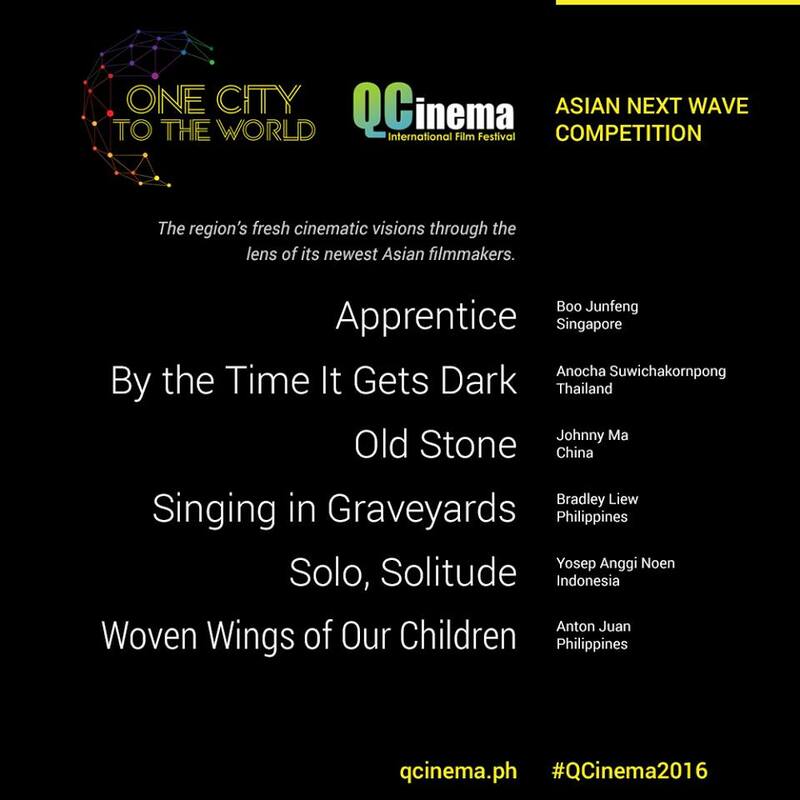 “Asian Next Wave” is the most recent addition to the QCinema competitions. This category showcases the works of Asian filmmakers with less than two directorial features. Or you can also check out the Full Schedule screenshots below or view them here. The festival’s opening film is Park Chan-wook’s recent Cannes winner, The Handmaiden starring Kim Min-hee, Ha Jung-woo, and Tae Ri Kim. For its “Screen International” section, QCinema bestows Philippine premieres to some of the films recently lauded in the international festival circuit. In keeping with the festival’s tradition of featuring a film trilogy every year, QCinema presents a special section, "Tribute to Kieślowski". To commemorate the 20th death anniversary of the celebrated Polish auteur, Krzysztof Kieślowski, the acclaimed triptych about European reunification includes Blue (1993), White (1994), and Red (1994). 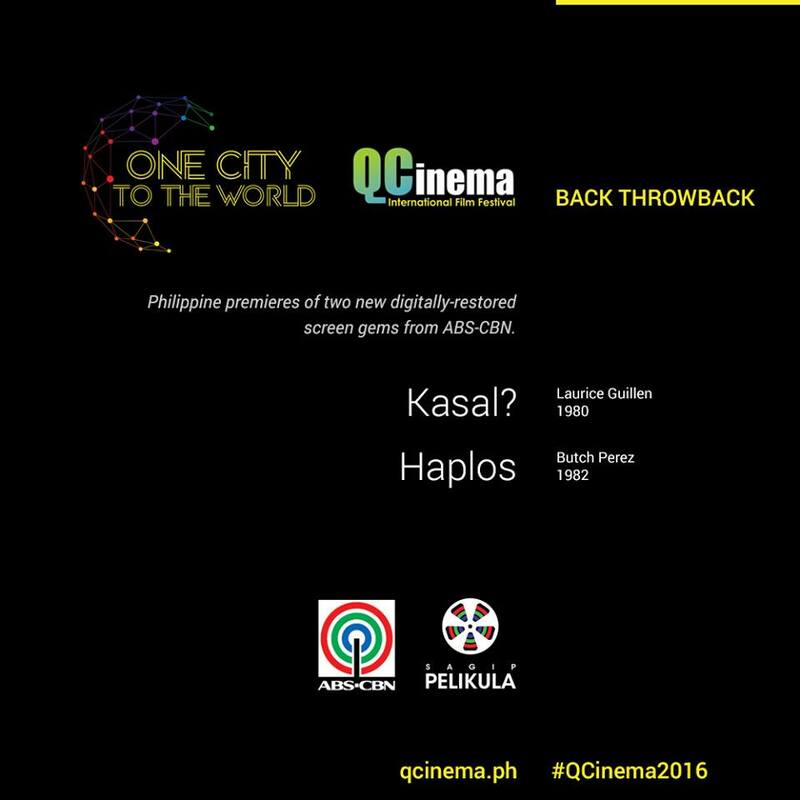 Two digitally-restored screen gems from ABS-CBN get their due revival in the section, "Back Throwback." 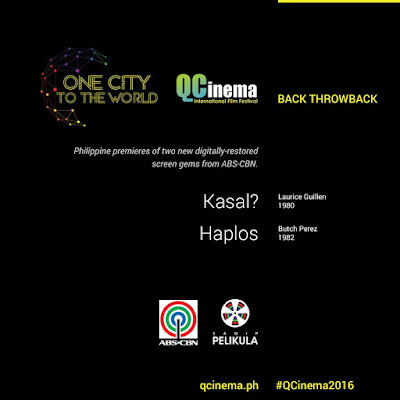 It will feature Kasal (1980) directed by Laurice Guillen and Haplos (1982) filmed by Butch Perez. The former marks Guillen’s debut feature and the latter top bills the exciting team-up of Vilma Santos, Christopher de Leon, and Rio Locsin. QCinema celebrates the thriving film communities outside of the National Capital Region (NCR), through its "Cinema Rehiyon" section, featuring the compilation of regional titles from Mindanao Rising, Across Luzon and Visayas, and Ilonggo Tales of Horror and Imagination. 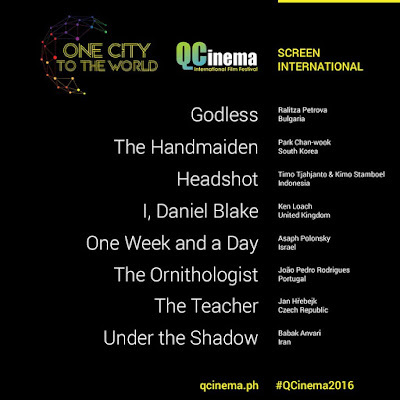 Also included is the Manila premiere of the new Cebuano indie by Christian Linaban, Superpsychocebu. 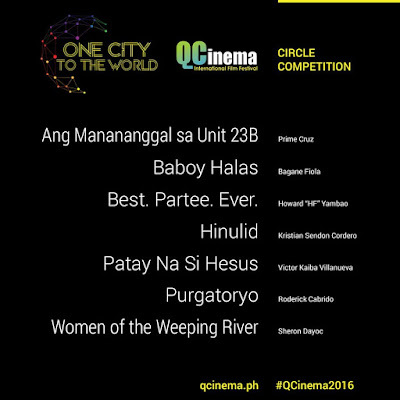 The awarding ceremony for the QCinema filmmaking competitions will be on October 19, 2016. Use of the festival pass is applicable to all malls. The festival pass is composed of 10 perforated stubs equivalent to 10 regular movie tickets that must be exchanged at the cinema ticket booth, subject to seat availability on a first come first served basis. One stub of the festival pass is good for one screening only. Meaning, if you have a companion, you cannot use the pass to redeem two tickets of the same film on the same schedule. The bearer of the festival pass can choose any regular screening film on any day of the festival starting October 14. For gala screenings, seats are subject to availability. Not valid for invitational or special blocked screenings. 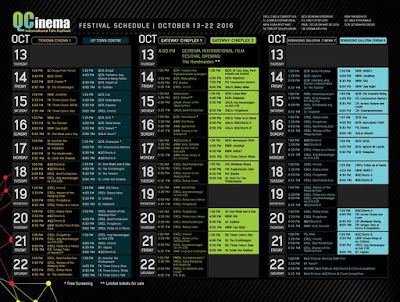 Festival and Day Passes will be released starting on October 13, 2016 at the QCinema festival booth in front of Gateway Cineplex Dolby Atmos Cinema. On the succeeding days, the passes will be available at the festival booth on each mall. QCinema will only release a limited number of both the festival and day passes. Reserve your festival pass now! Regular MTRCB passes not valid on festival screenings. Only MTRCB Board or staff IDs are accepted but not on gala, invitational or special blocked screenings. Use of the day pass is applicable to all venues and is valid for one day only. The QCinema day pass is composed of 4 perforated stubs equivalent to 4 regular movie tickets to be exchanged at the cinema ticket booth, subject to seat availability on a first come first served basis. One stub of the day pass is good for one movie screening only. Meaning, if you have a companion, you cannot use the pass to redeem two tickets of the same film on the same schedule. The bearer of the pass can choose any film on the specific date printed on it. For gala screenings, seats are subject to availability. Not valid for invitational or special blocked screenings.